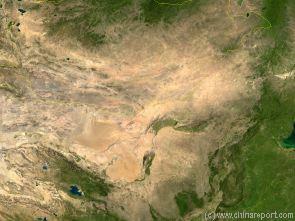 Satellite Image Map overview of North-West Xinjiang Autonomous Region, Mongolia, Inner Mongolia and North and North-Eastern China giving a Full Overview of the Gobi Deserts. Clearly visible details of geographical features such as mountain ranges, rivers, valleys and lakes. Map includes country borders, name and location details of Main Cities and Villages (clearly visible). Mouse over Image to Reveal more information and follow the flow & path of the yellow river from Xining in Qinghai Province to the Bohai Sea. The Beijing Western Railway Station mainly has trains heading North-West, South-West and due South out of the City of Beijing. These include the train to Datong in North-Shanxi Province, which is only the first main station on the Line through Hohhot to BaoTou, both in Inner Mongolia. From there take Train all the way around the Yellow River bend and past the City of Linhe in the Gobi Desert to end up at Yinchuan, Capital of Ningxia (Hui) AR. Another useful train south is the line connecting through Baoding and Shijiazhuang in Hebei Province, then on to TaiYuan and Pingyao in Central Shanxi Province. This Line will take you in 15 hours to Xi'An in Shaanxi Province, the Old Capital of Silk Road. View of the Destinct Figure of the 13 Story Tian Ning Pagoda crowned by it's large Pearl as visible from afar on the South Beijing Skyline. 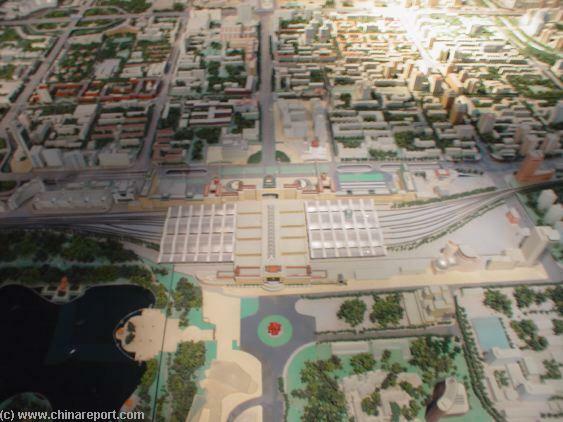 Overview of the Beijing western railway station and it's surroundings at the Beijing Planning Exhibition Hall (in the Chongwen District of Beijing). 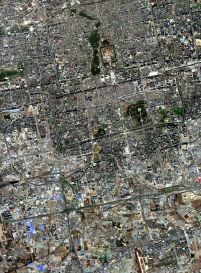 A Satellite Image overviewing Beijing Center and showing a large part of Xuanwu District with the described route to Beijing Western Railway Station, Tianning Temple Overpass and Fengtai in the Bottom-Left section of the Image / Map. 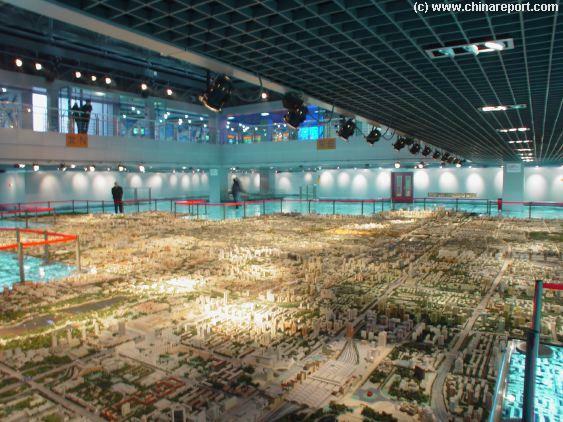 Overview of the Beijing Planning Exhibition Hall (Chongwen District of Beijing). Beijing the City has undertaken many upgrades to it's Public Transportation in preparations for the 2008 Olympic Games and to allow for the traffic volumes of a modern and economically vibrant world Capital. largest Station in the City of Beijing. Located just outside the Western Borders of the Xuanwu District, the Beijing Western Railway Station was (re-)constructed on the Site of an earlier station on the western outskirts of Beijing (we will have more details on this old line + station later), at the Village of Fengtai. 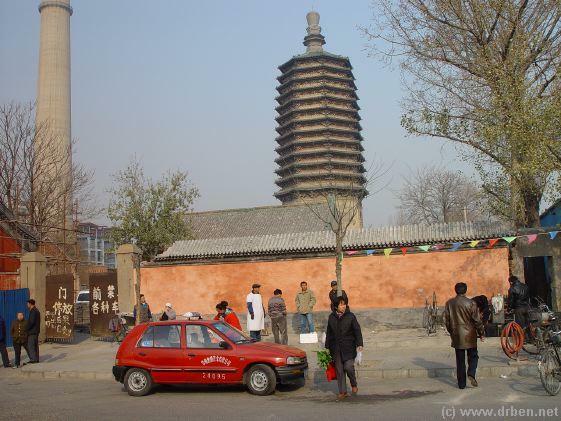 Fengtai was a village located west across the River from Xunwu Men, a Western City Gate. It is now an outlying district of the larger City of Beijing. Constructed in 1996 AD, at the start at a huge and still lasting leap of ambitions and succes by China's City-Administrators, the Western Railway Station of Beijing was created as one of the largest Railway Stations in Asia entire. The Western Railway Station was expanded in the year 2000 and now process over 300.000 passengers a day. Enough for the arrival of the expected 2 million chinese people visiting Beijing and the 2008 Olympic Games and future needs. Other Train Stations in Beijing are Beijing Zhan - Main Railway Station in DongCheng District, Beijing Bei Zhan - North Station near XizhiMen with the Train to the Great Wall of China at Badaling. And Beijing Nan Zhan - South Station, which is closed for modernizations. There is a fifth station somewhere too. The Western Railway Station is not hard to locate. From within the four Central City Districts of Beijing the Western Railway Station is most easily found by finding QianMen Dajie', which is the Avenue running East-West through the southern end of Tian An Men Square with it's QianMen, the former Front Gate. Having located this, go from QianMen, and simply head due West along QianMen Xi=West Avenue until you have reached the South Cathedral. This historic anicent Cathedral stands at the location of the former XuanwuMen City Gate, which is on the border of Xuanwu District and XiCheng District. From XuanwuMen it is still quite some way to the Western Railway Station, but keep going west. This is the route from XuanwuMen to BaiYunGuan - the Temple of the White Clouds. Due to alleged faulty construction, which left the roof of the Giant Complex leaking already just after opening there are rumours that the Western Station in it's current form cannot and will not last for long. More information on this in the Future. to the XunwuMen Highway overpass, then further passing west via Xunwu Men Xi Lu onto the TianNing Highway Overpass of the 2nd Ring Road. Below lies a concrete Canal known as the City Moat. It connects North, then North-West to Yuyuantan Park. At this point the Tian Ning Stone Temple Pagoda should come into your view to the South. There is also a concrete belonging to a factory which stand immediatly North of the TianNing Temple complex. Leaving the Highway Overpass you are now heading West on LianHuachi Dong Lu. Follow Lianhuachi Donglu for another kilometer, past the Public Security University (Police Academy), to find the Giant Western Railway Station. Not even the blind could miss it, it is that large. Taking a Cab or Taxi to the Station is easy. Any Taxi Driver will know XiKe'Zhan, if pronounced correctly. Otherwise show them on a Map. Currently it is not possible to reach the Western Railway Station by Subway / Metro, although Line 2 ends fairly nearby. There are many bus-lines passing through the Western Station, too many to mention in fact. If you insist on going by Bus, get yourself well and clearly informed which one to take ! As mentioned above, the railroads leading from Beijing can take you anywhere in China, since 2006 including Tibet via the Qizhang Railway. For more information on how to travel by train in China, backgrounds on China's railroads and their History and more. Please CLICK THROUGH - to our dedicated page. China's Trains generally run on Time and on Schedule. In the waiting lounge an electronic clock (often) shows when the next train to your destination starts boarding. Don't be late ! In the last 10 years there have been no major railway incidents on China's extensive network. There was however a major problem in spring of 2007 with the Tibet-Railway due to thawing of the underground. No deaths or injuries were sustained in the accident. It is unknown of this problem will re-occur in the next season. Both the Beijing Main Railway Station and the Western Station have exclusive Ticket Offices for International Passengers. Here English and other-language speaking personel can help you buy a ticket to anywhere in China. That is, if they are available at the Time and if you have the cash (or credit). Due to the gigantic size of the Train Station, some people have reported difficulties in finding the Ticket Office for Foreigners at Beijing Western Station. Find the International Ticket Office of Beijing Western Station central in the building, on the 1st Floor !! Easiest and most direct way is to enter through the Main Front Entrance at LianHuachi Lu, then head up on the first stairs. If you would like you can use an elevator. Most Hotels, China International Travel Service (CITS), and some other businesses in the central city can also help you get your train-ticket. Mind you ! Seats and Tickets on any train in China can only be booked up to 4 days in advance. One can only buy tickets leaving Beijing for another destination. No Tickets TO Beijing from elsewhere within China. It is not (yet) possible to buy tickets from other destinations returning back to Beijing. You will have to purchase those at the other Station, before your return trip. During May Day Holidays (Golden Week) and ofcourse in advance of the Chinese New Year it (Spring Festival) is impossible to get any train tickets. Get in the long line and be very patient, or else.. Go Figure ! The Beijing Western Station is very large, modern, reasonably clean and has several restaurants as well as fruit-stall and gift + candy shops to buy food at. They are open untill very late hours. Furthermore, usually snacks are provided (to buy) at each station along the way as well as by some of the train personel. In China at least, you can take a bet that food will be the least of your worries ! One can also have Tea, of course. Hot Water is provided for Free. 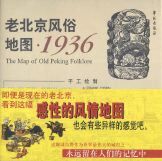 Map includes the location of Old Fengtai Village & River. Dial the Beijing to Lhasa Trains Hotline and order Tickets from anywhere ! At present three passenger trains travel to Tibet, respectively from Beijing, Chengdu (or Chongqing), and Xining (or Lanzhou) everyday. Tickets can be purchased up to 10 days in advance at the following stations. Here you will have to fetch your ticket when ordered. The One-way trip to Lhasa in Tibet takes 47 hours and 28 minutes. Beijing Zhan. Beijing Main Railway Station is located in the South-East corner of the DongCheng District, just North of the Ming Dynasty Era City Wall Relics Park. Always up to Date - Timetable of the Qinghai-Tibet Railway provided by the Chinese Government ! A Short listing and explanation coming soon ! !